The Columbus Saints SoundSport team is a prime example of making do with what one has. The group got its start with a non-existent budget and six kids drumming on picnic tables at a park in the group’s Ohio hometown in 2003. Founder and director Marshall Cheatham started his marching career in the Chicago Hornets Drum & Bugle Corps during the early 1970s, and then received a football scholarship to Vanderbilt University in Nashville. While there, he was exposed to the HBCU (Historic Black Colleges and Universities) style of show bands, which inspired him to start the Saints. Thanks to generous donations they were able to order a set of drums. The six students played at PeeWee football games, where other kids came over while still wearing their football equipment to express interest in joining the group. Over time, the drum line grew to more than 40 members. Members of the Columbus Saints march in a Dublin, Ohio Independence Day parade. Making their DrumLine Battle debut in 2013, the Saints added a SoundSport team in 2014 by acquiring 36 used G-keyed bugles as a more cost-effective alternative to standard B-flat instruments. Carlton says a focus on improving the lives of students in the group’s community is what drives the organization forward. “We now have a bassoon player who has learned a brass instrument by working with a volunteer instructor in the hallway of our rehearsal site. Another kid told us, ‘I’m in college band because of you.’ Through travel, we’ve exposed some kids to experiences they would have never had otherwise. We took the kids to Hardee’s and one mentioned it was the first ‘classy’ restaurant he had been to outside his hometown. He was in awe. The Columbus Saints perform in Indianapolis at the 2016 SoundSport International Music and Food Festival. The Columbus Saints have applied to be evaluated by Drum Corps International to participate as an Open Class corps as part of the 2017 DCI Summer Tour. Both Cheatham and Carlton went to the DCI’s annual winter business meetings in Atlanta this January in order to have “face time” with others who have transitioned to fielding a drum corps. If the corps is approved, they will do a small regional tour while still fielding a small SoundSport team. 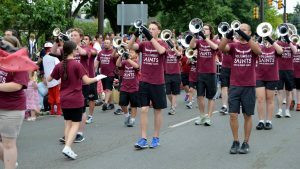 In a relatively short amount of time many students who learned their art in the Columbus Saints have gone on to perform in numerous college bands and other musical ensembles across the country. Both Cheatham and Carlton are quite proud of that fact. Carlton says, “To expose them to something they had never witnessed is a life-changing experience.